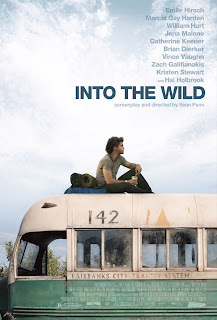 Into The Wild is story about Chris McCandless' experiences after graduating from Emory University. Instead of taking the conventional route after graduating college, Chris left his upper middle class family to "LIVE LIFE". [Chris was] an American wanderer who adopted the name Alexander Supertramp and hiked into the Alaskan wilderness with little food and equipment, hoping to live a period of solitude. "[written into book] Happiness only real when shared." "Mr. Franz I think careers are a 20th century invention and I don't want one." Despite all this jazz by Hollywood, which is extremely convincing while you are watching the movie, I was disappointed to discover that his journey may not have been as remarkable as was presented in the film. This just brings me back to reality. I was really feeling this movie, but this romanticized Hollywood movie probably isn't what it is all cracked up to be and the above passage helped me see that. Still, there's got to be more than life than working that 9 to 5.